Throw ON the Towel! – He Said What?! Here we go again. I heard it from upstairs…….the sound of the plastic containers full of coffee hitting the floor and then the thump. My heart sank as I hurried downstairs to check on Aaron. He was fine, although sprawled on the floor with spilled coffee all around him. 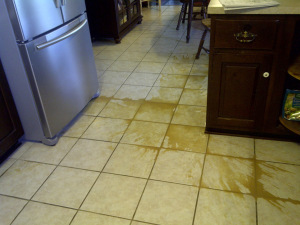 He jerked and dropped his coffee yet again………lukewarm coffee, thankfully. And thankfully he didn’t throw his coffee containers as he has been known to do when he’s in a rage. This was a true accident, but messy and discouraging none the less. I was frustrated with Aaron this morning over a couple things already and this didn’t help, believe me. My compassion for him still hasn’t quite kicked in yet. He has cleaned up and showered, and seems to be fine. I hope he’s not bruised.